Pass the popcorn and the tissues. I know there’s a good chance my heart will be softened and my faith stirred before the credits roll. While there’s nothing wrong with your team “just” hosting a women’s ministry movie night, sometimes we miss the opportunity to make a greater impact. What if instead of just a one-night showing of a movie, we made it part of an experience? Please note affiliate links follow. You won’t pay a penny more, but I may receive a small commission which helps to cover the monthly expenses of this site. Several years back our Bible study group gathered together to watch War Room after we completed Priscilla Shirer’s The Armor of God study. The movie powerfully drove home the importance and power of prayer. What if at your next retreat you found a movie that fit with your theme and opted for a movie night instead of an evening program? The theme at our church this year has been Psalm 71:14-15 about sharing about God’s part in each of our stories. As the release date for I Can Only Imagine draws near, it occurred to me just how very well the theme of that movie fits with our women’s ministry theme. Now it’s worth noting, the team did offer a ladies night out at the movie theater to see I Can Only Imagine. If you haven’t had a chance yet to see I Can Only Imagine, please read the synopsis below and check out the movie clip. I can think of many ways I Can Only Imagine could tie into a women’s ministry event. After hosting a workshop on sharing your faith. As the wrap-up of your Bible study on relationships, forgiveness, or redemption. As an introduction to a study of gifts. With a discussion time immediately following (found materials to use here). With the men’s ministry as a date night for couples in your church and community. You can find church resources for I Can Only Imagine here. Please also be sure to check with your staff about whether or not you need a movie event license. Movies can be a powerful tool for emphasizing a message. Something relatable and real happens when we watch a character struggle with their faith. The next time you’re tempted to “just” host a women’s ministry movie night, consider how you could create an event which makes a great impact. You just might be surprised by how deeply the movie’s message resonates with your women. Sorry – giveaway has ended! You have the chance to win your very own copy of the I Can Only Imagine DVD! To enter to win please comment below by midnight EST on Tuesday, June 12, 2018. Winner will be randomly selected. Winner will be contacted via email and must respond within 24 hours or a new winner will be selected. Winner must live in the US. Would love this to start a new Women’s Ministry!!! Would love this to start a Women’s Ministry!!! Movies are powerful. I didn’t get to see this in the theaters. I’d love to have a movie night with my women’s group! This is a great film. I could see us using it at our already scheduled fall retreat or the November “Sunday afternoon at the movies”. Thank you for the opportunity to win this movie! I live in Greenville where Bart grew up. His mother and father in law go to our church. This would be a really special movie night for us! A great idea for a Ladies fellowship. I would love to win this for our Women’s Ministry! Love this movie – planning a movie night for our youth. This would be perfect. I haven’t had the opportunity to see this movie yet, but I loved the movie clips that led up to it’s release. I absolutely love the way you have shown us several ways to tie this in to different Church ministry activities. Thank you for this opportunity!! Would love the opportunity to win this movie. We all need a good evening of fellowship and this would be the perfect one. I am excited to read of this opportunity because I was not able to see the movie when it originally ran at our local theaters. I help coordinate activities for our church widow’s ministry and a movie matinee would be great fun. Thank you for the many helpful resources that this website has to offer! Thank you for the opportunity to win the “I Can Only Imagine” movie. I’ve wanted to see this movie from the first I saw it advertised. This would be wonderful to watch with the ladies of our church many of whom haven’t seen the movie either and to invite unsaved friends to join us. Wonderful, would love to incorporate a lot of that in to make a awesome night. Would love the movie. Love to be able to show this movie. This would be great opportunity to reach out to our ladies for fellowship. I would love to win a copy of this and watch it with my women friends, especially my friend Karen who had given me the CD of the song after my mom’s passed away many years ago. This is such an awesome movie!! I would love to share it with our group of ladies! As a ministry leader of a small church I am always looking for ways to bring together women of different age groups. Showing this movie would be a great event for women of all ages! We haven’t seen this movie yet. Would love to share it with our women’s ministry ladies at church. Thanks for giving us a chance to win the DVD! I would like to watch this movie. It sounds inspiring! Our Bible Study group recently finished up our latest Bible Study and decided for the summer to get together once or twice a month and watch some good true story Christian videos that they had never seen. This one would be perfect. I would love to win the movie! I haven’t seen it yet! Thank you for all the great ideas! We have used many for our “new” Sisters’ Fellowship that has been refashioned this past year. I am planning on showing the movie “I Can Only Imagine” at an outdoor movie night at my house in August to wrap up our SUMMER SISTERS events. I will most likely incorporate some of the discussion questions from your site. I’ve heard so many good things about this movie. I have been praying for our church and ladies group that God would stir us up and give us a special blessing that we would do more for Him. We as a church group watched the War Room a few years ago, it has changed my prayer life tremendously. I feel that this movie I Can Only Imagine will do the same. Thanks so much for the everything! This is a great idea!! I am a pastors wife and am also leading a women’s Bible study and would love to do an event like this. Our ladies appreciate all the time they can get together and what a great way to invite new ladies in! This is a great idea for our Monthly ladies meeting ! This came at the perfect time. I just took on a lot of responsibility for our Women’s Ministry Team and pulled off a successful Women’s Fellowship Dinner- we will be having it as a monthly event. It went so well that I’ve been playing around with the idea of hosting a mid-month movie night as well. Your post was encouraging and gave me some great ideas. Thank you! This is an awesome idea for our Women’s Ministry night at church. I think it would also be great to host one for the entire church as well. Thank you so much for the idea. This would be a wonderful night out for some bonding with the women in our group and any new arrivals!! We saw the movie and it is such a thought provoking movie!! It would be great to share with combined Women’s & Men’s Ministry event!! I love the idea of a movie night. We have not done this with our ladies. I can only imagine how exciting it would be to win this DVD! And, I would share it with the women at my church by working with women’s ministry team to organize an evening event. They haven’t done that during the five years that I’ve been a member of the church. I think it is time to start! Such a great idea! I am looking forward to using this idea in ministry. Thank you!! I love the ideas you have for Women’s ministries. This is a great idea! Thank you for your insight. Thank you so much for all your wonderful retreat resources. I’ve used movies at retreats several times and showing a movie as an evening activity has been very successful, as long as I don’t do it every time. I’m also learning how to embed clips into a powerpoint presentation so I can grab just the portion of the movie I need to illustrate a specific point. The best approach seems to be to mix up the ways I present to keep things fresh. People learn in so many different ways and I have to keep in mind that just because I like something, it doesn’t mean it will resonate with the group. Participant feedback is critical to keep things relevant. My husband and I just facilitated a couples retreat in April and I kind of forced him to show the movie we were using in its entirety on Friday night, complete with popcorn. Some of the couples had worked all week and travelled quite a distance. They were glad to sit together and relax for two hours together without having to “get into it” right away. We wanted to make sure we ended by 10 pm, so we gave them two optional questions to ask each other back in their rooms. We were really surprised (and pleased!) to find out on Saturday morning that they had actually discussed the questions the night before. Thank goodness it worked out, because you never know until you do it how something is going to land. Thanks again for all you do. Your posts inspire me to keep going. When women’s retreats hit the mark, connections are made over the course of a weekend that could take years in the wild. One group of women that met on retreat several years ago still get together once a month to check in. That’s magic! You have some great ideas for adding more impact to a movie night. Thanks! This would be so helpful to us! We’ve never hosted a movie night but it sounds like it could be fun! It would be wonderful to get a copy for our church library. It would be a wonderful movie for a Woman’s Group Movie Night. We could maybe even open the Movie Night up to anyone in the church who would like to join us. This would be a great way to reach out to our community. We are planting a church and I know this would be an avenue to create conversation, encouragement, and space for God to work in the hearts of those watching the movie. Would love to own this for our church. But not just for our Ladies, but for our men too..
From what I have heard, this is very powerful for both men and women. Our men today, need something like this so much. They need to be encouraged, challenged and reminded who they are, not who the world says the are.. I didn’t get a chance to see this at the movies. What a wonderful idea to have a movie night with the ladies! A friend and I are just about 2 months into starting a women’s ministry at our church and movie night was on our list of ideas! Thank you for all of your ideas and tips! I would love to own a copy of this movie to offer to our church/women for movie night. And, seeing you mentioned the movie War Room I must share we had Marie Armenia as our past speaker for our ladies event. She and her husband Phil both came. Marie’s mother was the role model for Miss Clara in War Room. Marie has a book she has written about her mother, The Audacious Molly Bruno, that she brings to events and signs each and every one sold. I have included her contact information. If you are a women’s ministry leader please share Marie with your women in your church. Your lives will be touched. We had her January and her message is still brought up in conversations. Our theme was LEGACY and not sure how we will inspire our women in 2019 after Marie’s powerful message but I know God can. Please tell Marie Teresa in Josephine shared about her with you. We had a bonus too, Marie’s dear friend, (and she was Molly’s too) Brenda Harris, had retired to our area and is the prayer coordinator for Kendrick Brother’s Films and has connected with our women. We love her! This would be a great ministry tool for our church. It would be great to have an event shared by Women’s and Men’s ministry!! I didn’t get the chance to see this in the theater, I would love to host a movie night with my girl friends. Thanks for all the work you do to help us in our walk with God! This is so a God move right now. I have been planning on hosting a movie night for our ladies. I planned on doing a night of relaxation at my home to thank them for all the hard work they put into a Mother’s Day function we had. This was actually one of the movies I was seriously considering. I am so thankful God shows us when we are going in the right direction. 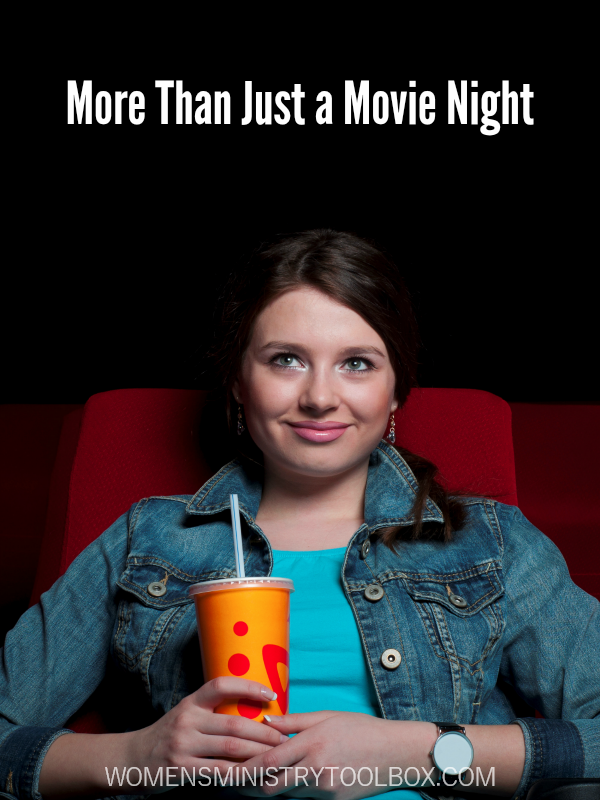 I love the idea of making movie night an event with a great impact. Thanks. This was an excellent movie! I’d love to use it for a women’s movie night. I loved the movie and want to host a women’s movie night at church! Love finding movies that can be shown in church and have valuable life lessons. Looking forward to planning an event for this one! I can’t wait to see this movie and share it with our church. I would love to share this movie with our Ladies ministries group at church. This would be a great movie night for our ladies. I would love to be able to present a copy to my younger brother, who is disabled. This would be great!! Our women’s ministry would love to do a movie night!! What a great ministry tool this would be!! What a great idea! We’d love to show this at our next women’s ministry event! At the last Women’s camp I went to with my ladies, the planning committee decided to do that. My women really enjoyed it! This would be a great introductory movie to start a movie night with our women. Thanks! what a great idea! we are always looking forward to different activities to bring women together and spark a good discussion!